MapMyIndia, a manufacturer of GPS and In-dash vehicle devices for navigation using maps, has launched a new device that will not only continuously monitor your vehicle but also keep reminding you about how you can maintain it better. The new product called Rover Bike is a discreet motorcycle tracker that once fitted to your bike, lets you see where it is in ‘real-time’ through a secure mobile app. Rover Bike keeps updating the live location on the maps, with the direction as well as the speed. The geographical positions are automatically monitored giving you live reporting of location, travel direction and speed even 90 mins after the bike has been switched off. Other than tracking your bike location, it helps to monitor insurance, PUC renewals as well as to improve mileage, vehicle maintenance, and reporting. In addition to the above, the product also provides speed indication, detailed journey history, idle time duration, ignition status and over-speed reports. Since it also has GPS, it can help you navigate to your destination, while tracking your driving through the journey. “Many of our innovations have made car travel more comfortable, productive and connected. With bike tracking devices like Rover Bike MapmyIndia wants to offer these benefits to motorbike users also,” said Shivalik Prasad, Executive Director at MapmyIndia. The device is small and comfortable to use measuring at 70mm x 40mm x 20mm, weighing at just 85 gms. The company hasn’t detailed out how it can be attached to the vehicle, but it comes with a quad GSM module and a 9-30 V voltage input. If you’re purchasing this device, make sure you download MapmyIndia’s app as well, as the app is the easiest way to track the vehicle and get regular reminders. 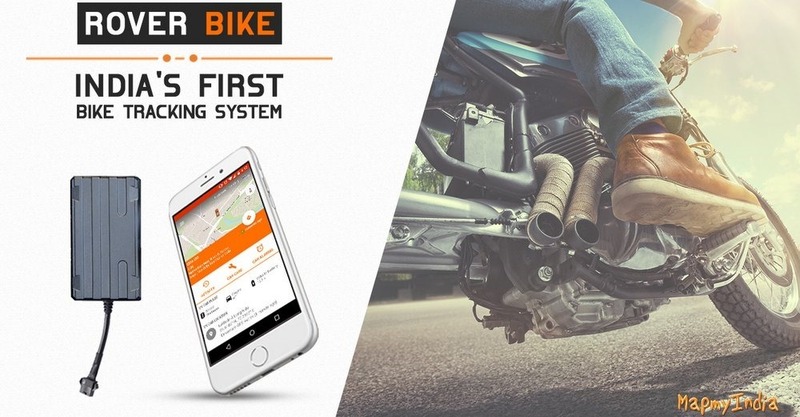 Bike owners will find that the app is quite helpful in analyzing the summary of their journey, and keep a track of their vehicle even when it is shut. The company has priced the product at Rs. 3,990 which is decent ( some may find it expensive though) for an IoT device that provides you details of your bike and the ride comprehensively. "MapmyIndia Launches Rover Bike, A Discreet Motorcycle Tracker Plus Bike Monitor", 5 out of 5 based on 4 ratings. RBI Removes Limit On ATM Cash Withdrawals, Bank Counters; Digital Transactions Drastically Reduce! Customers & Drivers Start a #DeleteUber Campaign in the US; Lyft Surpasses Uber in Daily App Downloads!